Po Toi Island is located at the southeastern corner of Hong Kong against Stanley. The woodlands of the island attract various passage migrants such as flycatcher, warblers and thrushes to stop over. It is also possible to view seabirds during the return ferry trip as well. Tung Ping Chau is a small island located near to the mainland in Mirs Bay. This flat island attracts many passerines during spring and autumn. 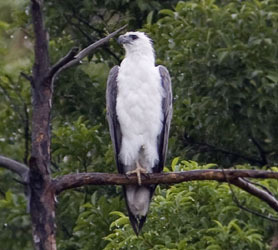 Terns, skuas and White-bellied Sea Eagles may be spotted during the ferry trip through the Tolo Harbour. Tap Mun is a small island lying between Tolo Harbour and Mirs Bay and it is accessible by ferry. During the seasons of passage migrants and summer breeding, seabirds like phalaropes and terns may be spotted and it is possible to view the White Bellied Sea Eagle roosting on the branches on the island and above the surrounding sea.